Jeff Mirich, a long time NWSRA member, passed away from pancreatic cancer on Dec.11th ,2012 at the very young age of 56 yrs.old!! It’s been a long hard battle for all of us and we are just glad he is not in pain any more. We want to thank you all for your support and love during this difficult time. Thank you for the emails and phone calls. We would like to suggest that instead of sending any flowers, if you?d like, you can make a donation to the Lustgarten Foundation for Pancreatic Research. 22700 Running Rabbit Ct. Canyon Lake, CA. 92587. Jeff was a natural, very gifted athlete that could do anything he tried, without much effort!! He was an avid ski racer, boat racer, scuba diver, motorcycle rider…you name it, he tried everything and did everything to the fullest…AND with the BIGGEST smile you’ve ever seen!! Enjoying every second, inch, mile, race, ride that he was on!! Just an awesome athlete and lived life to the fullest til the very end!! Even a spontaneous Jeff moment ski ride to the Isthmus, Catalina, moor their boat at favorite spot, scuba dive all day and then sometimes ski back to Huntington Beach!! That was Jeff!! Full throttle!! He and Char ski raced from 1984 to 1993. 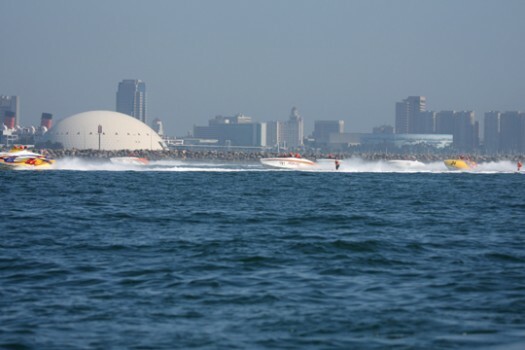 He participated in the Nationals in the Flatbottom class and the Outboard class. He skied the Catalina Ski Race several times, and competed in marathons with Char in the Double Up class. They both started the PolarBear Fun Run..(Winter Catalina Ski Ride(Race) on New Year’s Day) just cuz it was something to do after a New Years Drink!! haha!! Char made and did all the Ski Race video tapes for years…for all the Drivers, Observers, Teams with the funny input from Jeff!! 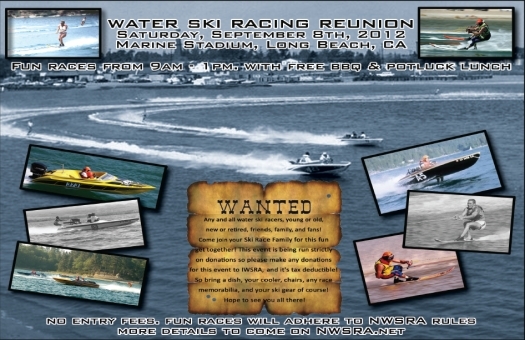 Back in July we heard that Andy Anderson is putting together a Water Ski Racing Reunion on September 8th, at Long Beach Marine Stadium. He has now published the event schedule below. A letter from Ken Durham …I ran across www.skirace.net, and was hoping that you may be able to help us locate a teammate who was also a National Water Ski Racing Champion in 1973 and 1974. My name is Ken Durham, and I was (am) a member of the Undefeated 1974 Cal State Long Beach Varsity Rowing Team. We are preparing for a major reunion, and have been trying to get in touch with all of our team-mates. However, we are having trouble locating Don Henderson, who at the time also was a distinguished water ski competitor with the NWSRA in Southern California. He is listed here http://www.nwsra.net/uploads/pastnat.pdf as two-year champion in the “16-19 Boys” division. I know his brother John also raced, but have not run across his name anywhere. Would it be possible to run a search announcement of some kind on your website? Having grown up in and around auto racing, I know that old racers of any kind a never completely out of touch with their sport – and maybe we can track down Don through a friend or former fellow competitor. You can read a little more about our search at our coach’s website: http://www.rowingevolution.com/node/80 . 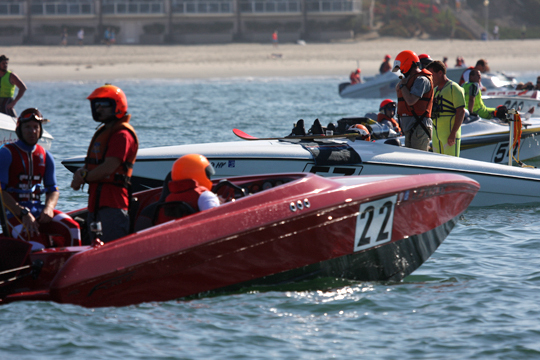 Daren Van Ryte of www.ocphotographics.com has shared a great selection of shots he took at last weeks’s Catalina. The official results of the 2012 Catalina Water Ski Race will be posted on the Catalina race site here: http://www.catalinaskirace.net/results.html but at the time I made this post they were not up yet. 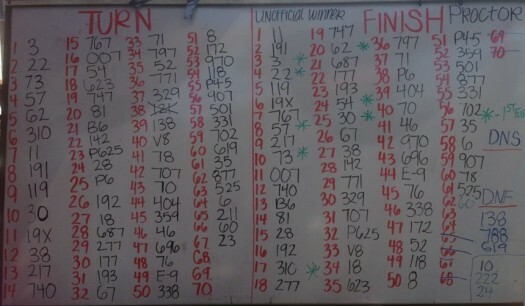 In the meantime, here are the placings posted on the board after the race. I’m not 100% sure of how this will work but racetheworld.net will have transmitters in a number of boats taking part in the Catalina Water Ski Race tomorrow. Log on to www.racetheworld.net and track some of the top contenders during tomorrow’s race. Teams from around the USA and the world are arriving at Long Beach, California for the 64th Catalina Water Ski Race. Top contenders such as Wayne Mawer, Todd Haig & Peter Proctor have been doing the early morning practice runs to Catalina and back since last week, along with a host of others. Whilst the the excitement builds for the big event, please spare a thought for the man who pulls this event together. Click here to learn more about Ken Vaughan and his fight against cancer. I was sat at the Maya last night and Wendy Feros joined us for a drink. That’s when we heard the news that Kenny Vaughan has cancer. If you don’t know, Ken organises Catalina and before him, his dad did the same. 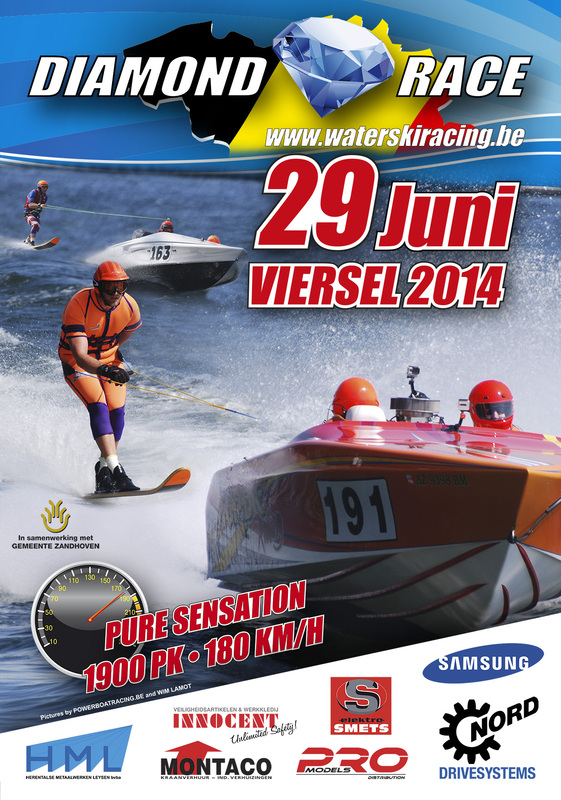 Below is a message from Catalina Water Ski Race Committee. 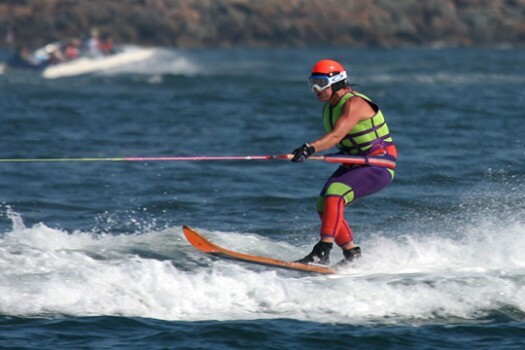 As many of you know our Catalina Water Ski Race Director Ken Vaughan is fighting cancer. This struggle has been very difficult for him both physically and financially, State Disability Insurance only goes so far. Ken would never ask for help himself, so his family and friends are going to ask for him. If you could please donate some funds to help that would be very much appreciated. 10 minute documentary of Terrible Herbst Motorsports Racing at the 62nd Catalina Water Ski Race. By Sinister Film Productions. Ski racing has lost one of its great characters, namely Mike Bemis from the USA. Sadly 3.5 years later we are reporting that on Saturday 21st April 2012 Mike Bemis passed away. Mike was a US National Champion on multiple occasions. 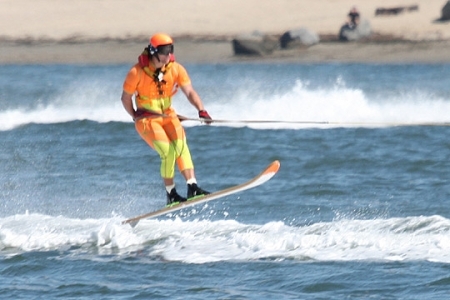 He was a lively presence on the beach and along with his skis, binding, handles, rope, tape and other accessories, will be missed by many. Mike was a long-time member of the Lake Arrowhead Water Ski Club, a former World Speed Barefoot Record Holder, and was a fixture of US Ski Racing manufacturing his own racing, training, and fun ski’s. He was also part of an episode of the TV Show “Baywatch” back in 1990 where they did an episode on the “Avalon Ski Race”, a re-creation of the Catalina Ski Race. He will be greatly missed. There will be an open house gathering on Saturday, May 5th at Mike’s sister’s home in Rancho Cucamonga. Sincere condolences from the around the world go to Mike’s family and friends. 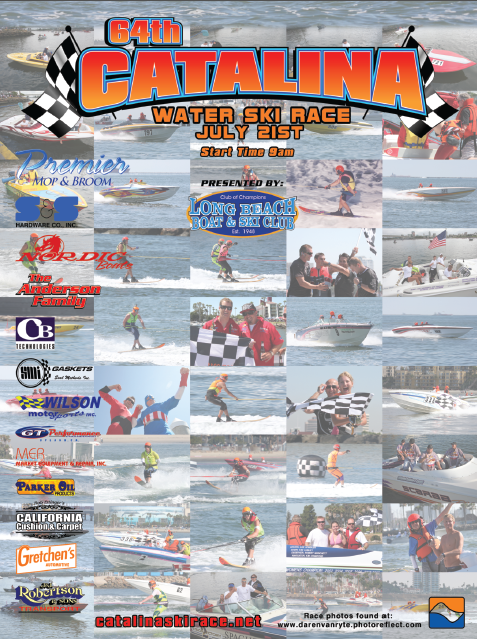 Ken Vaughan has published the poster for the 64th Catalina Water Ski Race which will be held on July 21, 2012. The host hotel is Hotel Maya at Long Beach, CA. Click the image below to open the PDF. More details to follow. 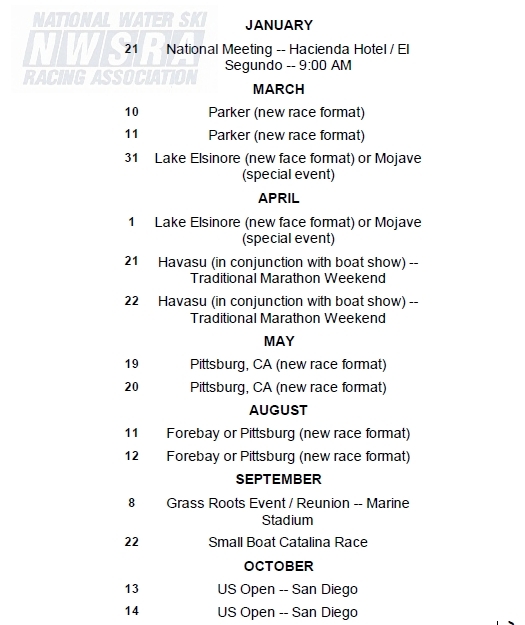 The American NWSRA has published its official 2012 Water Ski Racing Calendar for 2012. Courtesy of Scott Atkinson, Editor of ‘The Water Skier’ magazine published by USA Water Ski, below is a PDF of the “Down to the Wire” article which appeared in the November/December 2011 issue of ‘The Water Skier’ magazine. Ski racing’s Pete Mitchell tragically passed away on 22nd September 2011 while at Parker, Arizona, USA. Official news on the exact circumstances around the event are being awaited. Which sport will join the Olympic Games programme? With the International Olympic Committee (IOC) recently announcing its shortlist of sports vying for inclusion in the 2020 Summer Olympics, SportsPro is asking its readers, which one of the eight contenders will be added to the programme for the 32nd Olympiad? While baseball still remains as popular as ever in America, the IOC clearly deemed it to have less appeal on the world stage when, in 2005, it announced that baseball, like softball, would make its final appearance at the 2008 Games in Beijing. Despite making the latest shortlist, the sport is unlikely to be chosen so soon after being excluded, but will the IOC be convinced enough by the new bid to perform an uncharacteristic about-turn? Softball’s high proportion of female participants may be its advantage over other sports in the list, mainly because the IOC is looking to increase female involvement in the Games. In fact, while the IOC noted the sport’s lack of global appeal for its exclusion from the programme, many were shocked by its decision, considering its well-publicised commitment to gender equality. Though softball has the support of Australian Olympic Committee president, John Coates, will the sport gain enough backing from other members of the board to see it reinstated on the Olympic roster? 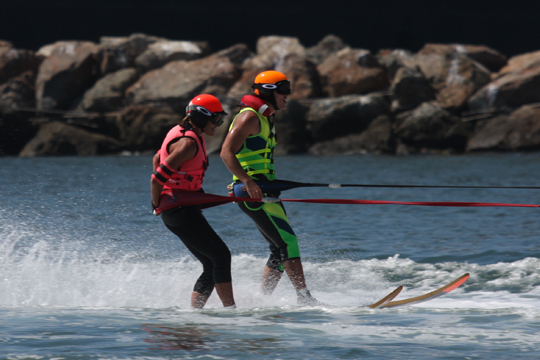 The International Waterski and Wakeboard Federation (IWWF) was recognised by the IOC in 1967 and, since then, it has grown to include over 90 member nations and organise a number of international competitions. 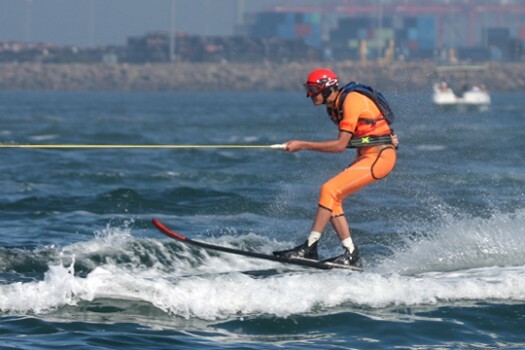 Of the eight sports vying for inclusion, wakeboarding is the only watersport and its popularity is growing worldwide. IOC president Jacques Rogge said the sport “provides great entertainment for the spectators and adds further youthful appeal,” but will that be enough to see it included in the 2020 programme? Squash’s campaign for a place on the 2020 sports programme has been led by one of the sport’s legends, six-time World Open champion Jahangir Khan. President of the World Squash Federation (WSF) until 2008, Khan believes that, while squash has been trying for inclusion for several years, it should be included “on merit.” Now, the WSF has turned to Vero Communications, run by public relations strategist Mike Lee, who previously worked on the successful summer Olympic bids for London 2012, Rio 2016 and the Qatar 2022 football World Cup bid, as well as the 2018 Winter Olympics in Pyeongchang. Having narrowly missed out on the 2012 and 2016 Games, will it be a case of third time lucky? While many in the climbing world doubt whether the sport will actually be included in nine years time, merely being considered by the IOC is widely regarded to be a huge step forward for the multi-discipline event. In 2007, the International Federation of Sport Climbing (IFSC) was recognised as the world governing body for the sport, giving the newcomers the necessary organisational backing in the face of widespread criticism. Amongst other things, huge costs to build venues, a lack of popularity and doubts about broadcasting appeal have been outlined as reasons why the sport will not be included come 2020. However, despite its opposition, the sport remains popular in Europe and is growing rapidly, so will it be chosen when the IOC meet to announce the winner in Buenos Aires, 2013? In its review of roller sports’ previous bid for Olympic inclusion, the IOC cited the sport as having relatively low worldwide reach, little media appeal and small revenues for its failure to include it in the London 2012 programme. On the plus side though, the sport would cost little to stage, as it requires no new facilities, and would appeal to a younger audience. Roller speed skating, one of the sport’s sub-disciplines, is currently present at events like the World Games, the Pan-American Games, the Asian Games and the Mediterranean Games, but will roller sports win over the Olympic committee skeptics? Despite being put forward, along with squash, to the final two in the selection process for the 2012 Games, karate missed out on being included due to receiving just a third of IOC member votes, well short of the two thirds required for inclusion. Over the years, the sport has been championed by Ticky Donovan, who helped Great Britain to five consecutive World Team Championship victories. According to him, “it’s the tenth most popular sport in the world and there’s 50 million people training now. We should have been included in the Olympics many years ago – it’s long overdue.” Do you agree with Donovan? As taekwondo is to South Korea and judo to Japan, so wushu is to China. Based on traditional Chinese martial arts, wushu is a full-contact discipline and would make for interesting viewing for foreigners who haven’t ever seen any action. But, despite the sport’s novelty factor for many, its obscurity and vast array of styles and judging criteria will most likely see it overlooked by the IOC, especially with the better known karate in the running. One proponent of the combat sport is film star Jet Li, himself a former Chinese wushu national champion. According to Li, realistically wushu will not be included for many years to come, but will the IOC take a gamble on the lesser known martial art? SportsPro Media provides a range of multi-media communications for the B2B sports industry. Our team delivers the latest news, insights and analysis from the international business of sport, principally through our monthly SportsPro magazine, the DailyDeal e-bulletin and via our website: www.sportspromedia.com. The SportsPro Daily Deal website offers details of every broadcast, sponsorship, personal endorsement, infrastructure, sports property and agency deal done in sport with a value of more than US$500,000. We also produce a range of specialist supplements and annual reference reports (such as the F1 Black Book) that enable our clients and subscribers from the sports industry to make informed and efficient business decisions. Working in partnership with an international portfolio of rights holders, sports sponsors, marketing professionals, broadcasters, governing bodies, federations, sports agencies and manufacturers, we have built an enviable reputation for the quality, depth and integrity of our products and services. 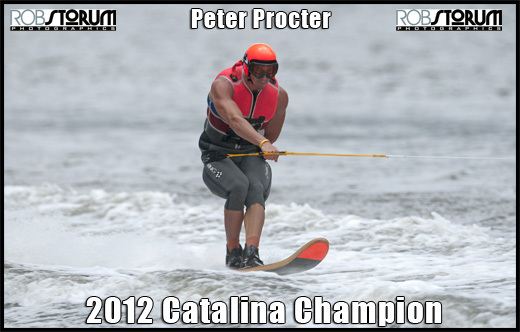 Thanks to Ken Vaughan, below are the full official results from the 2011 Catalina Water Ski Race. 16th July Long Beach to Catalina Island and back. The 63rd Catalina Ski Race .66 boats on the start grid. Weather conditions perfect.As the engines started to roar a shiver went down my back..
“We have everything set in motion, and this Carmageddon deal with the 405 freeway happened. Long story short we have everything in place and ready to go, but we can not get a frequency from the FCC to broadcast from the Helicopters back to the Hotels. No frequency = no live feed. It was suggested that we record the race and broadcast it, but again with no frequency, the announcers can’t see the race for the audio etc.. I would like to say, this isn’t one of those we threw in the towel deals. SpotonDL has fought, clawed, bribed, borrowed, and begged to try and make this happen. A frequency is never impossible to come by, but with this news deal, every news agency in town is here, and the LAPD took the rest of the frequencies.. We even went so far as to talking to main guy at the FCC for the west coast, and tried to run it in a 2 hour window to no avail. Announcers Sandy and Rick will be bringing the action with their amazing commentary. 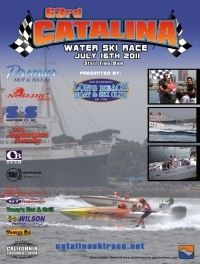 The 2011 Catalina ski race will be broadcasted live via the internet . The infamous broadcasters Sandy ” The Sandman” Schwartz & Rick “Parker Oil” Fuscardo are yet again in the hot seat for the 63rd Catalina Ski Race. 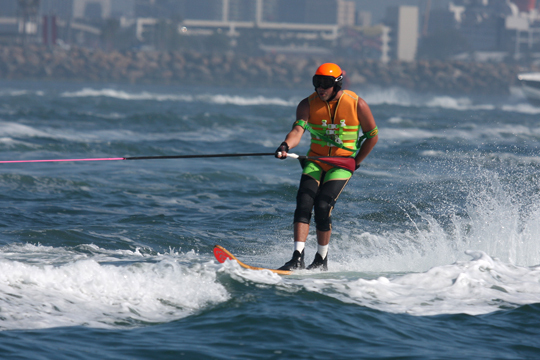 Follow Scott Brooks at the Catalina Water Ski Race From Wednesday 13th July with all the up to date events as it happens . If you can’t be at Catalina and want to know what is happening this is the place to watch it ! 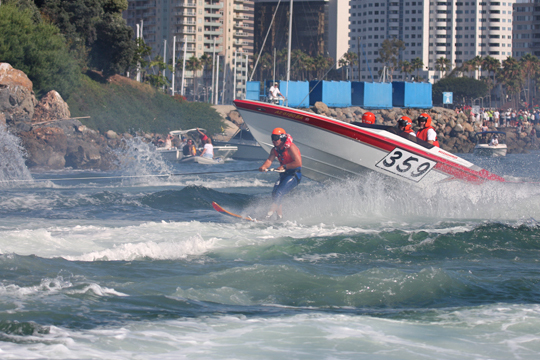 The USA has announced their team for the 2011 World Water Ski Racing Championships. The 63rd Catalina Water Ski Race will be held on July 16th, 2011. American Mike Harker suffered a massive stroke and passed away April 8th in St Martin, French West Indies. Mike in his mid-60s wa about to sail from the Caribbean to the Mediterranean. Britians Jake Frame Junior 2010 British Champion is looking for a ride in this years Catalina Ski race. On Sept 5, 2010, America’s Byron Whipple passed away in Lakeport, USA as a result of a boating accident – more. Below is a great selection of racing shots to remind us of Byron’s career in the sport. If anyone who knew Byron well would like to write a tribute that could be included here, please get in touch. 20 Year old American Cameron King lives at Manhattan Beach, California, and when he’s not ski racing, he’s studying Architecture at Orange Coast College in Costa Mesa. 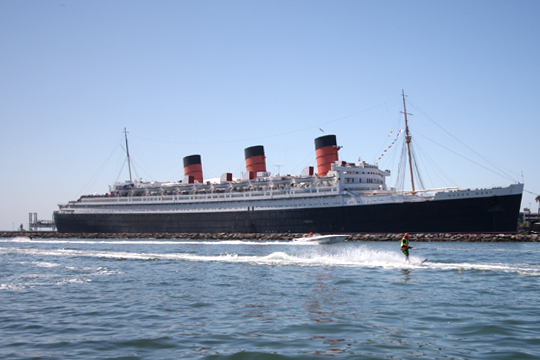 1938 race from Catalina Island to Hermosa Beach, California. Archived footage of the 1955 New York to Atlantic City Water Ski Race. The race took 8 hrs over 110 miles.. Many thanks to Geoff Watson for digging this up. The 23rd Annual “Austin Dam to Dam Race” will be hosted by the Austin Barefoot Ski Club on Saturday, November 6th at Steiner Ranch Lake Club, Lake Austin, USA. 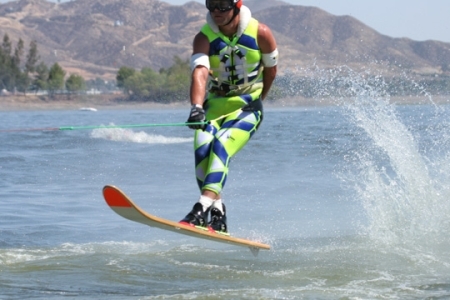 The U.S. Open Water Ski Racing Championships took place recently on the Colorado River’s Parker Strip in Parker, Arizona. Titles in 20 divisions were fought for and won. Fellow ski racers – please send 1 or 2 of your most prized photos of Byron Whipple and yourself… along with a favorite story/ funny moment/ or a crazy time with Byron to share with his family at his celebration of life on Oct. 9th, 2010. Please forward to Casey Whipple as soon as possible: CaseW3@yahoo.com or mail to 4765 Lakeshore Blvd. Lakeport, CA 95453 USA. Byron’s family has asked in lieu of flowers, donations can be made to brighten the streets of Lakeport by contributing to a Lamppost that will be named in his honor in downtown Clearlake. Rest in Peace Whip, you are missed so much and will never be forgotten…too many great memories shared with great friends and family! Until next time….Ski ya later! Sandy Frey put together a great compilation of shots from this year’s Catalina. Catalina organiser Ken Vaughan has sent in a couple of great ariel shots of the weekend’s big event. Thanks to Ken Vaughan for the official results of the 62nd Catalina Water Ski Race. I know that Ken has put so much into this event and I congratulate him on what I’ve been told was a tremendous event. Courtesy of Carlos Rosas of CR Productions, below is a video of the interviews he did with Pete & Lauryn after the race. The first shot is a photo finish between Todd Haig (closest) and Peter Procter (you can just see his ski) and it goes to show how incredibly close the finish was. 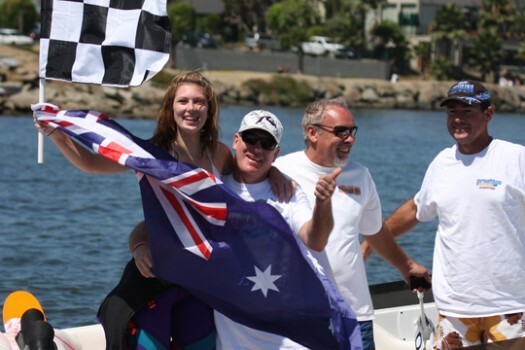 After a nail biting race with 9 time Catalina winner Todd Haig, it was Peter Procter & the Warpath Team that became the winners of the 2010 Catalina Water Ski Race today. 17 July Update: Teams will get up very early today (Saturday) in Long Beach to get to the start line for the 62nd Catalina Water Ski Race. 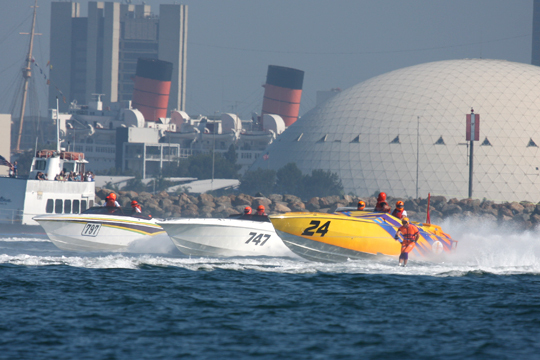 8.53am – Start between Islands White & Grissom in Long Beach Harbor. W SWELL 2 TO 4 FT AT 10 SECONDS. Watch 2009 – Catalina Island Video footage. Cameron King is organising the Catalina Ski Race Go Kart Tournament – Region 2 Fundraiser. Before the big race on Saturday come down to Irvine to find out who is King of the track. Everyone is invited and all profits will go towards local ski racing and getting new skiers into the sport. You can sign up as a single driver, $50, or as a team of 4, for $175. Teams will be awarded points for each finish a driver makes, like the 800 point system (1st-800, 2nd-600, 3rd-450, etc…). The further a driver moves on in the tournament, the more points a team can receive. Only 60 drivers can enter so hurry before all the spots are taken! Even if you dont want to race, come out and support friends that are racing. Hope to see you all there! Todd Haig’s mum Susie has announced that Todd and his wife Amy are expecting a baby around February 5, 2011. Todd Haig, Katelin Wendt and Tyler Murray secured overall wins at the Clear Lake Marathons in the USA on 22/23 May. Complete race results will be delayed until at least June 3rd and published at www.nwsra.net. Britain’s Russell Cox has been racing since the 1970’s. A GB Champion in his younger days, Russell is looking for a team to tow him in this year’s Catalina. 18 year old Will Newland of GB is looking for a tow in this year’s Catalina, ideally in F2. On January 30th, 2010, Dawna Patterson Brice was inducted into the Riverside Sports Hall of Fame (Riverside California). She was recognized for her contributions to the city of Riverside as well as her athletic achievements. Hang on – Out Now! America’s top ski racing photographer Daren Van Ryte has now published his book; “Hang On”. The US Open was a great success with over a 50% increase in participants from 2008. The USA has the US Open which has been moved to the Parker Strip on the Colorado River in Parker, AZ instead of San Diego for this year. The start of the 61st Catalina was a challenge for all the smaller boats to get out the breakwater into the open sea. 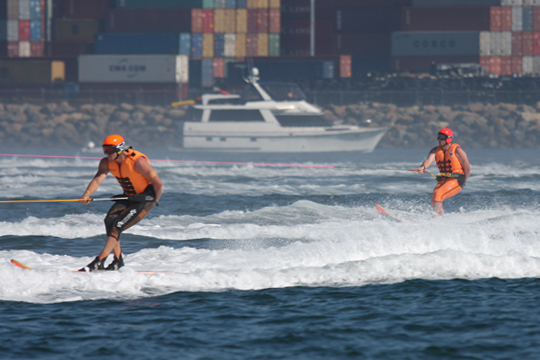 Some skiers fell which caused a delay to the start of the bigger boats, which started 9 minutes later. 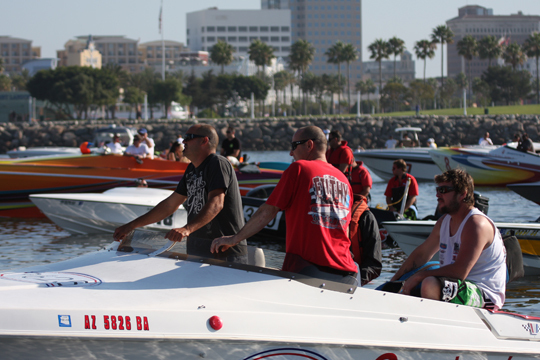 Daren Van Ryte was at Long Beach on the weekend capturing the action under glorious Catalina sunshine. 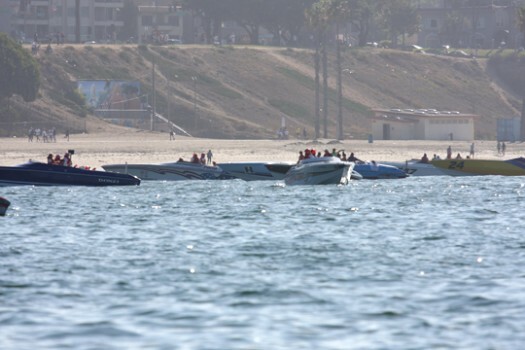 Thanks to Ken Vaughan, below are the full and final results of the 2009 Catalina Water Ski Race. There is a growing number of photographers doing some great work and it’s excellent that you share your work with the ski racng world. 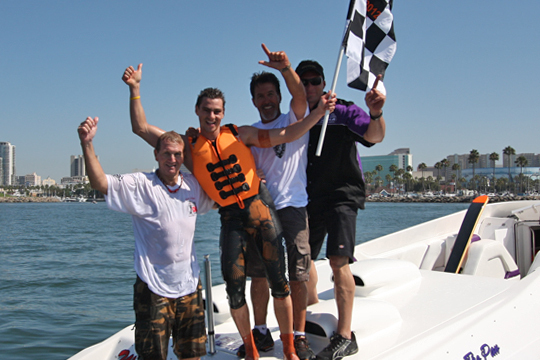 America’s Todd Haig won the Catalina Water Ski Race today at Long Beach California for the 9th time. Britain’s Kim Lumley won the Women’s for the 7th time and took 3rd Overall and broke the all-time Women’s record by 5 minutes. As the 2009 Catalina approaches, many of the world’s best prepare for the 61st event. Even with the Worlds starting in Belgium on 19 July, the likes of Kim Lumley, Todd Haig (both 2008 winners) and others will be heading to Long Beach to participate in the great race, before flying to Belgium in a bid to secure more World titles. Below are a few photos of the Hotel Maya. The host hotel for Catalina 61. Keith Brice has just written to say that the great boat racer Bill Simpson sadly passed away on 14 June 2009. 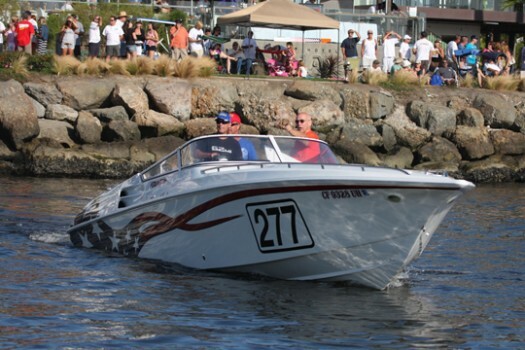 He was the owner of the GN ( grand national) Kilo record setting boat the “Tub of Fools”. 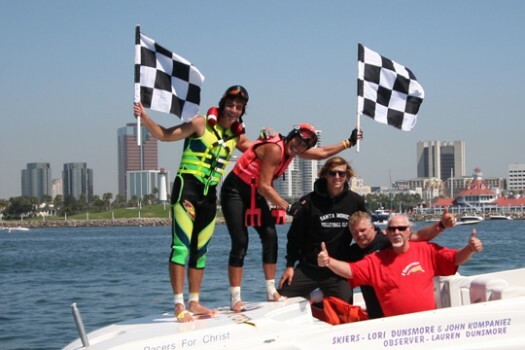 It was the last boat Dawna Brice ever raced behind. Andy Anderson reports: On Saturday, May 9th NWSRA Region II hosted its “Puddingstone Fun Day” sponsored by Goldsmith Construction. The event was designed to encourage entry level participation and incorporated some fun races similar to what are typically run by the Lake Arrowhead Water Ski Club. On 9 May, America holds a Puddingstone Fun Day sponsored by Goldsmith Construction with some social races geared towards entry level competition and just having a good time. The Karl Brooks Ski Training Camp took place recently at Lake Mead near Las Vegas, USA. Karen Brooks has published this report. Jeff Barrus of Goldfinger Racing Productions has once again produced an outstanding piece of water ski racing footage in this 4 minute reel of movie action captured during a recent US F2 race. With just over a week to go – Karen Brooks , Martin Brooks, Kurt Brooks, Scott Brooks, Scott Gibbons, Sam Clapson, Jack Lynch, Daryl Tyndall, William Newland, Billy Smith, James Smith, Kristian Bartley, Alex Benny, Amy Clarke, Lucy Gale are all off to Las Vegas! 12 superb shots by Daren Van Ryte from the recent racing at Parker USA. See Peter Proctor, Lacey Nordblad and others captured in action. 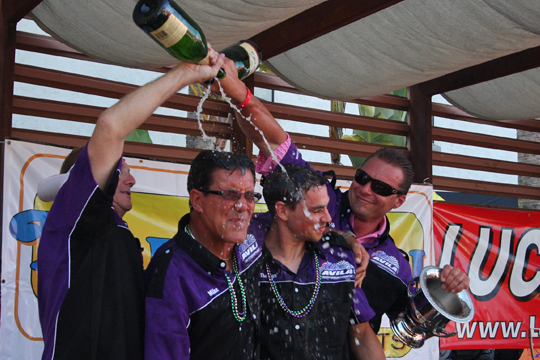 As most people in water ski racing know, Mike Avila has achieved a lot in the sport of water ski racing. He’s been on the ski and in the boat at the highest level and accomplished a lot in both roles. Nads vs. Nads Racing from Jeff Barrus on Vimeo. 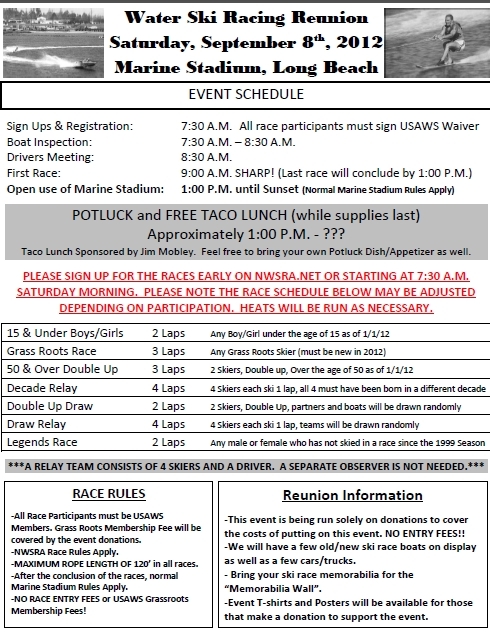 America’s Andy Anderson has announced a fundraiser night to promote “Puddingstone Fun Day” – a day with entry level races and a unique racing format. Many will already have heard the terribly sad news that Howard Haig passed away on 9th January. Howard was returning from a trip to Miami and was taken ill whilst at the airport. An ambulance took Howard to hospital, he was stabilized, but then passed away. So many people will be saddened by the loss of this most charismatic and friendly member of the water ski racing world and my thoughts go to his sons Todd, Michael and other family and friends at this difficult time. Thought I would give another update on Kevo. The new year brought special meaning to our family as Kev was coming home. He now is resting at home under the care of his wonderful wife and looked in on by all of the great people that love him and have missed him so much. Kev is in no way brand new yet as he is still weak from the horrible test that he has been through. He still has two drains coming from his side and the vacuum for the cut down the middle of his tummy. He still has weeks of drugs to take for the infections but the great news is they have worked and are working to get them out of his body all the way.They say the cut for the surgery will take a few more weeks to close up and then time to heal from there. My sister and Kev got to have there Christmas and I know for her it was the best one ever as she recieved the present sent from heaven. I do know that all of you wonderful people that prayed for Kev or just wished him well that it worked and it continues to work. I will never be able to say thank you enough for helping to stop our family from loosing Kev. He was so close at times to leaving us but your prayer and wishes kept him here. Kevo fought like a Sparten for his life and I am so proud to be a part of the love and friendship that has surrounded him during his fight. All of you that helped with your prayer and hope should feel so proud as well as we have saved a life. We have helped one of gods gifts to stay here and continue to give his love and support to everyone he touches because that is who he is. This will be a great year for our family and for all of you that believe that it is not what you have in your life but who you have in your life, it is not about how hard life will fight you but how you fight back. If you have the love from friendship and the love of family there is not a battle you cant win.This year will be so hard for many with the way the World is today, with jobs becoming less and less and money harder to make. We all need to remember that this is just one of the fights that life brings on to us and how we fight back is what is important. If you have your health and you have your friends and with the love of family you can take on anything. I believe in my family and my family of friends and with that all of the fights that life will bring on to me are no more than bumps in the road that I will get over and be better for it.Kev has proved this as well, he will get past this and be better for it. Remember when you feel like the world is pushing you down look into your heart and push back !! I thank you all for being there for my family and I truly love you so much for it. The 2009 Polar Bear Catalina Ski Rally is getting close and a great way for those in the US to enjoy some off-season time on a race ski. America’s Carl Johnson dropped me a positive note this week with the great news of his recovery after the accident he suffered recently. I was taken of the ventilator last Sunday and have started to recover quickly. I have been sent home to recuperate there. Overall I am doing well and look for a speedy recovery. Daren Van Ryte was at the US Open taking shots of the event and managed to grab a few nice Bunny Hops that he will send in shortly. Here’s one of the Cole brothers for starters. Many people all over the world know America’s Mike Bemis. He has been in our sport for decades. Mike is now suffering with a brain tumor which has grown to the size of a half dollar. On Wednesday there is a preop and next Tuesday is the surgery at Loma Linda. When Nikki Yedor last spoke with Mike, he was in good spirits. I am sure that many people share my wish that Mike gets through this quickly and with as little suffering as possible. You can send messages to Mike via info@nwsra.net or in the comments section below. Chris Davidson of Performance Boats magazine interviewed Randy Davis & Ross Wilson of Nordic Boats, Lake Havasu City, USA. 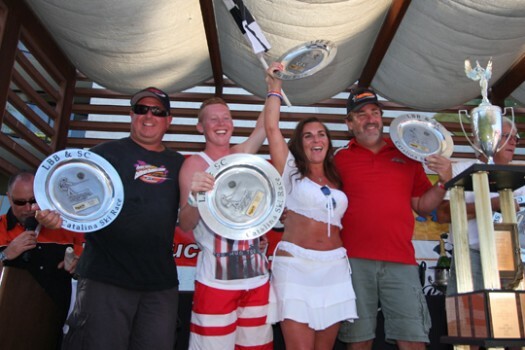 Chris Davidson of Performance Boats magazine interviewed Randy Davis of Nordic Boats, Lake Havasu City, USA. As many people reading this will know, Randy is Todd Haig’s driver, with Dennis Hall in the observer’s seat. Catalina 60 – who will it be? The 60th Catalina Water Ski Race is just around the corner and some of the best teams in the world are preparing for the event that has drawn skiers from all over the world for decades. Justin Frank writes …the first Karl Brooks Jr. Ski Clinic was a great success! We had junior skiers of all ability levels participating over the weekend, some who have only competed in one race and others who have been racing for most of their lives. The common goal that the participants shared was that everyone learned something new.